Apple fans, start your engines! AirPods are still hard to come by if you shop at Apple. In fact, new orders placed right now on Apple’s website won’t ship until next week. Seriously, what on Earth is going on at Apple these days? If you don’t want to wait 10 days for your new AirPods to arrive, we have some great news for you — they’re in stock right now on Amazon at they’re normal retail price of $159. But wait, there’s more good news. 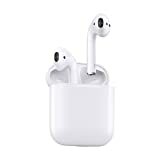 The Apple MMEF2AM/A AirPods Wireless Bluetooth Headset aren’t eligible for free two-day Prime shipping, you can get free same-day Prime shipping in a bunch of different regions! Definitely grab a pair while they’re still in stock.